Thanks for visiting! This page has not been updated in a while and information on it may be out of date. For current information, please take a look at Our Initiatives or our Blog. 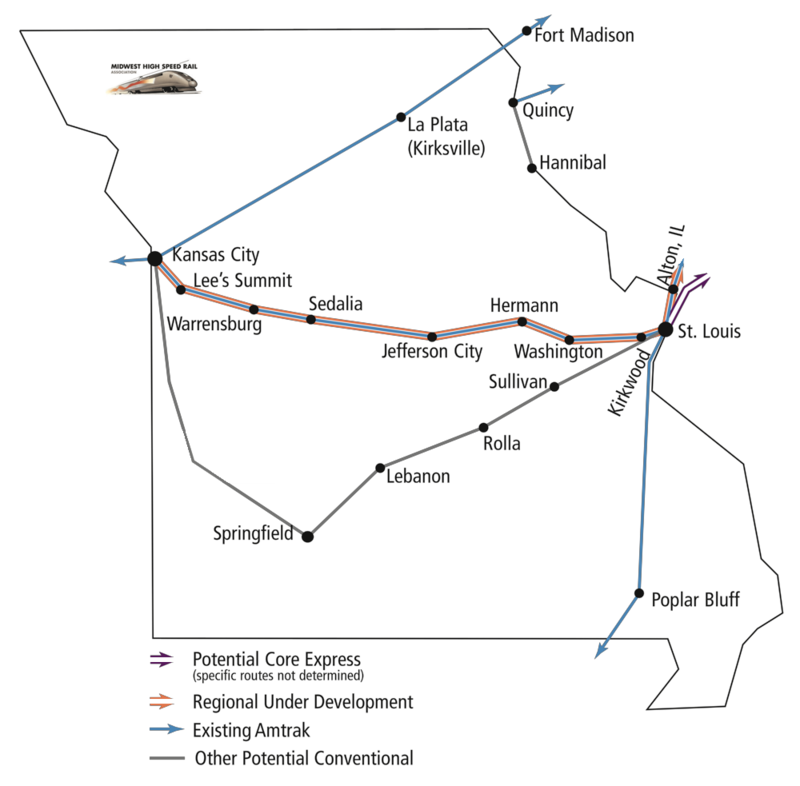 New Federal requirements endangered rail service into Missouri, but closure of these routes appeared to have been prevented for the time being thanks to action taken by Missouri’s US Senators. This route has already seen many upgrades which has increased its ridership, but more upgrades are needed. Missouri is a perfect state for the implementation of high-speed rail. A high-speed rail line between St. Louis and Kansas City is feasible and would economically benefit both cities. However, with no plans for high-speed rail between the two cities in the works, Missouri’s high-speed rail future looks dismal. Missouri must make passenger rail infrastructure a priority or it risks alienating itself from its fellow Midwestern economies and transportation systems. The Midwest High Speed Rail Association proposed a bullet train from Chicago-St. Louis that would make the journey in less than 2 hours. An October 2013 feasibility study on connecting Chicago/O’Hare with St. Louis found it would be feasible to bring high speed rail to Illinois. Unfortunately, no plans for the installation of the 220 mph route have been made. The $1.5 billion project included replacing about 183 miles of track and several train stations along the Amtrak Lincoln Service line. With construction set to be completed in 2017, the trip will soon be an hour shorter than current trips, with a total of eight trains a day. Upgrades to the Chicago-St. Louis Lincoln Service have been highly anticipated for a long time. The project, funded from a federal government grant, includes improvements to stations, safety improvements and railroad improvements that allow trains to travel at 110-mph. With the project finally nearing completion, riders are beginning to reap the benefits. Currently trains are already running up to 110 mph from Dwight to Pontiac and will have the same capability from Joliet to Carlinville once construction is completed in 2016. Moreover, Intermittent portions of the Amtrak Lincoln Service are double tracked but for more efficient service the whole line needs to be double tracked. Currently, the entire line from Chicago to Joliet is double tracked. The rest of the route features periodical double tracking. A Federal Rail Administration study found that double tracking the entire route would improve travel times and increase ridership.Click here to learn more. New federal requirements are endangering the Lincoln Service, Missouri River Runner and Southwest Chief routes. Legislation to save these routes are pending in the US and Missouri legislatures. Amtrak in Kansas City is in danger, despite being used by 700,000 Missourians! A new federal law requires Amtrak to modernize the rails; however, KC Terminal owns the rails and refuses to pay for the safety upgrades. The $30 million project is required by law to increase safety of trains on this vital line. US Senator Claire McCaskill (D-MO) introduced legislation to delay the December 2015 deadline to 2020 so that Amtrak and KC Terminal can come to an agreement to pay for the modernization. If this line is closed, Kansas City will be cut off from St Louis and Chicago, and Amtrak trains running from Chicago to Los Angeles will be unable to use the lines. The Lincoln Service between Kansas City and St. Louis was improved drastically, but upgrades are still needed to add daily frequencies and increase speeds. With $31 million from the American Recovery and Reinvestment Act, MoDOT has improved the railway linking St Louis and Kansas City. These improvements have increased the ontime percentage of this route from 64% in 2008 to 90% in 2014 and nearly doubled the ridership. This project also included station improvements in St Louis and intermediary stops, construction of new bridges and double trackage in two areas. This line still needs improvements, such as increasing the daily frequency from two to four, track upgrades west of Jefferson City to allow travel over 90mph and the introduction of express trains. MoDOT studies all indicate that these improvements would increase ridership and create stronger economic ties across Missouri.